I haven't read any of your books, but Terry Goodkind, that sounds good. Have a fun week reading this week! OOh looks like you have a good week ahead of you! Have seen some of your upcoming books in the blogosphere! Happy Reading! Crossroads is on my list this week as well. 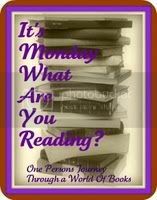 Have a fantastic week and happy reading.